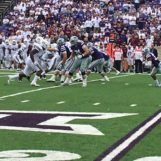 Manhattan, Kan. (westernkansasnews.com)–For the first time since 2014, Kansas State hosted an SEC team at Bill Snyder Family Stadium. Unfortunately for the Cats, No. 18 Mississippi State looked like a team on a mission. The Bulldogs amassed 538 yards, including 384 on the ground, in a 31-10 win over K-State in front of 49,784. Both teams not only went three-and-out on their first possessions, but also traded field goals. Mississippi State scored first on a 30-yard field goal by Jace Christmann with 9:07 remaining in the first quarter to put them up 3-0. Kansas State would march back down the field to tie the game at three with 3:53 remaining in the period on a 26-yard field goal from Blake Lynch. Two plays after converting a 3rd & 18, the Bulldogs saw Nick Fitzgerald connected with Kylin Hill on a 16-yard touchdown pass with 14:20 left in the half to go up 10-3 after the Christmann PAT. Mississippi State scored once more in the half after forcing a turnover. A three-play drive was capped off by a 28-yard touchdown run by Hill with 3:33 remaining in the half to go up 17-3. That would be the score at the break. Mississippi State would score on their opening drive of the second half to push their score to 24-3. At the 10:18 mark of the third period, Fitzgerald hooked up with Austin Williams on a 13-yard touchdown pass. Kansas State would finally force their first turnover of the season in the third quarter with an interception by Wyatt Hubert. On the next play, Skylar Thompson hooked up with Dalton Schoen on a 23-yard touchdown pass with 2:20 left in the third quarter to cut the deficit to 24-10 after the Lynch extra point. When it looked like the Wildcats would get the momentum, the Bulldogs ended that. Following K-State’s drive, Mississippi State would score the final points of the game. With 13:16 remaining in the game, Hill found the end zone again from 16 yards out to go up 31-10 with the Christmann PAT. Mississippi State saw Nick Fitzgerald go 11-27 passing for 154 yards with two touchdowns. Their top receiver was Stephen Guidry, who caught two passes for 42 yards. Kylin Hill rushed for 211 yards on 17 carries with two rushing touchdowns, and had three total. Fitzgerald added 159 yards on 19 carries. The Bulldogs got 384 of their 538 yards on the ground, and were 7-12 on third down. Kansas State saw Skylar Thompson go 7-17 for 86 yards with a touchdown pass. Alex Delton went 2-4 for 14 yards with an interception. Dalton Schoen caught two passes for 34 yards and a touchdown. Alex Barnes was the leading rusher, with 75 yards on 17 carries. The Wildcats finished with just 213 yards of offense, with 113 on the ground. The 384 rushing yards allowed by K-State were the most since 2010, when Nebraska rushed for 451 on K-State. It was Mississippi State’s first road win against a Power Five school since 1995, when they defeated Baylor 30-21, when the Bears were in the Southwestern Conference. Kansas State is 1-1, and will host UTSA to wrap up non-conference play Saturday at 3 pm, while Mississippi State improves to 2-0, and hosts Louisiana Saturday evening at 6:30. Defensive Back Walter Neil Jr.